Car hire in the 1920s, with The Priory Garage in 1927. Homepage. This page: An invoice for taxi hire dating to the late 1920s, but not for transporting people. 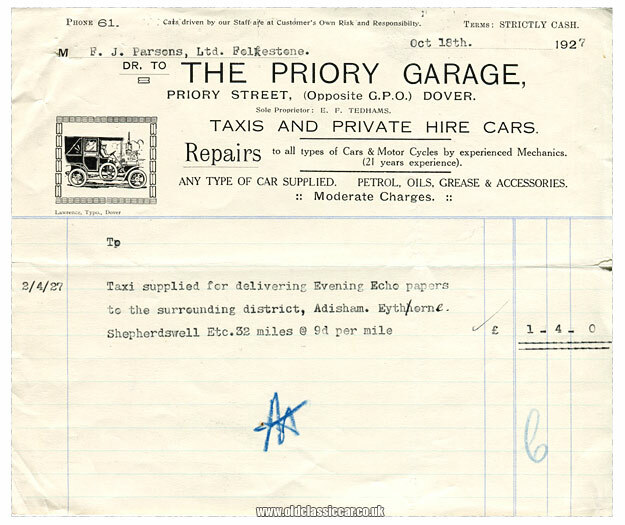 I doubt very much that the Evening Echo would have regularly been delivered by taxi to the residents of Adisham, Eythorne, and Shepherdswell, yet in April 1927 a vehicle was hired from The Priory Garage for just such a purpose. In all, 32 miles were covered, for which the grand total of £1 4s 0d was charged. Despite the hire taking place in April, the invoice wasn't raised until mid October, so the business couldn't have been in too much of a rush for payment. In addition to the hire of private cars and taxis, Priory Garage could also handle repairs to all manner of cars and motorcycles, as well as supplying the usual consumables such as oil, petrol and the rest. Happily, only "moderate charges" would be made, we're told. The premises were situated on Priory Street in Dover, opposite the G.P.O. (General Post Office). While there doesn't appear to be a garage on this street any more, a look at the former Babyland shop's premises suggests that the building they're in could well have started out as a garage (link to current shop details). The garage's proprietor was E.F. Tedhams. While a contemporary RAC Handbook refers to The Grand Garage (Townwall Street), Central Garage (Cambridge Street), and Lewis Bros Ltd (Cherry Tree Avenue), it doesn't list The Priory Garage as being an RAC-affiliated emporium. The invoice is made out to F.J. Parsons Ltd, at the time a prolific publisher of journals along the south coast of England.